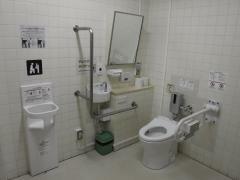 Located in a public facility, this toilet is mostly used by visitors to Kyoto Asny. Use slope to get into building, head for Heiankyo Sosei-Kan Museum, and toilet is on right. There are textured paving blocks in the lobby, entrance and in the library. When sat in the universal toilet, there is a movable handrail on the left side and a fixed handrail, automatic flush sensor and emergency button on the right. Hand washbasin is small, so keep the water flow to a minimum.